My mother didn't get it when her only daughter would want to mow the lawn. After all, she had two sons for that purpose, didn't she? I loved yanking the starter cord—sometimes over and over—and hearing the motor rumble to life, then adjusting the choke just so. It was a pleasure to walk up and down, slicing the yard into neat rows. Other areas were better for rectangles, where I'd start at the outside and spiral my way to the center as if walking a green labyrinth. Contrary to all the rules, and what really inspired my passion for mowing the grass, was walking barefoot behind the machine, letting the cut blades of grass turn my feet a bright green and having the intoxicating smell of mown grass fill my head. It was those first mowings of spring that I loved the most, when the grass was rich and dense and most fragrant. Many years later, my friend Linda Colwell introduced me to another passionate scent of spring when she offered a spoonful of a pale, hay-colored liquid from a jar in her refrigerator. I smelled it before I tasted it, a light, citrus-y, floral aroma with a tinge of bitterness to balance its sweetness. 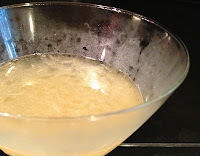 It was an elderflower syrup, made from the first blossoms of the Sambucas nigra, or elderberry, that she had gathered at Ayers Creek Farm in Gaston. It took me two years to finally get around to making my own, pestering Anthony and Carol Boutard with inquiries about when the bushy plants would be blooming. It was a sunny spring morning when I drove out, about three days after the blooms had first appeared, and Carol thought there would be blooms enough to make a gallon or so of syrup. She drove us out in the all-purpose Gator, with Tito sitting on my lap and guiding us to the orchard of mixed fruit trees and elderberries. We walked through the tall orchard grass from one plant to another, snipping off the delicate clusters of white flowers that were in full bloom, leaving others that weren't quite fully blossomed for another day, or to form berries that could be harvested later in the summer. Carol said the two gallons of flowers we'd gathered, about a full shopping bag, would make a gallon of syrup. 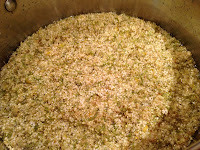 When I got home I checked my friend Hank Shaw's blog for his elderflower cordial recipe to use as a guide. With some coaching-by-text (you could call it "cexting") from Linda, three days later I had about a gallon of a rich syrup that we've been using to make spritzers and cocktails. I've frozen little jars of the cordial to pull out this summer and serve over ice, with or without the addition of a little alcohol, to remind me of the scent of spring in the Ayers Creek orchard, wandering through the grass with Carol. It's almost as much fun as having green feet. Combine the water and sugar and bring to a boil, stirring until the sugar is dissolved. Remove from heat and allow to stand and cool to room temperature. While the syrup is cooling, zest the lemons and juice them. 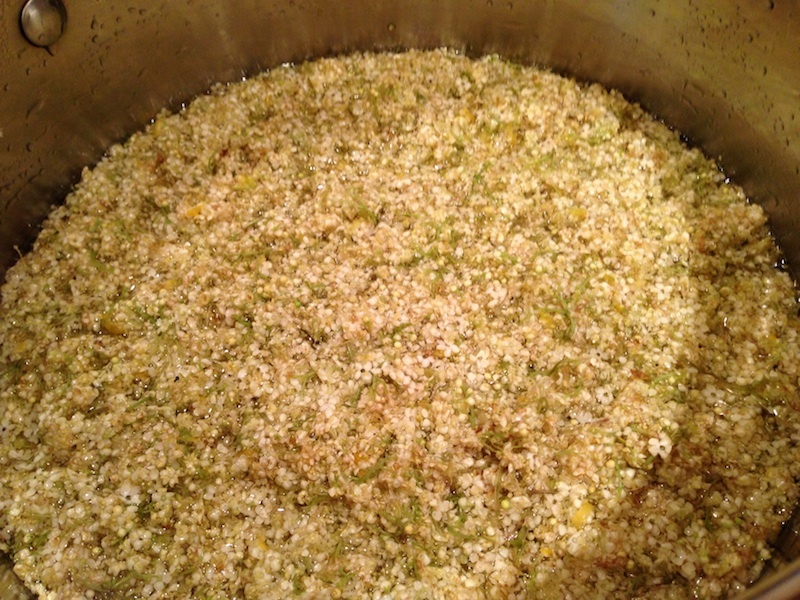 When the syrup has cooled, pour it over the blossoms and stir in the lemon juice and zest. Cover the pot with a towel and/or a loose-fitting lid and place in an out-of-the-way spot for three days. Uncover and strain through fine mesh sieve or cheesecloth. 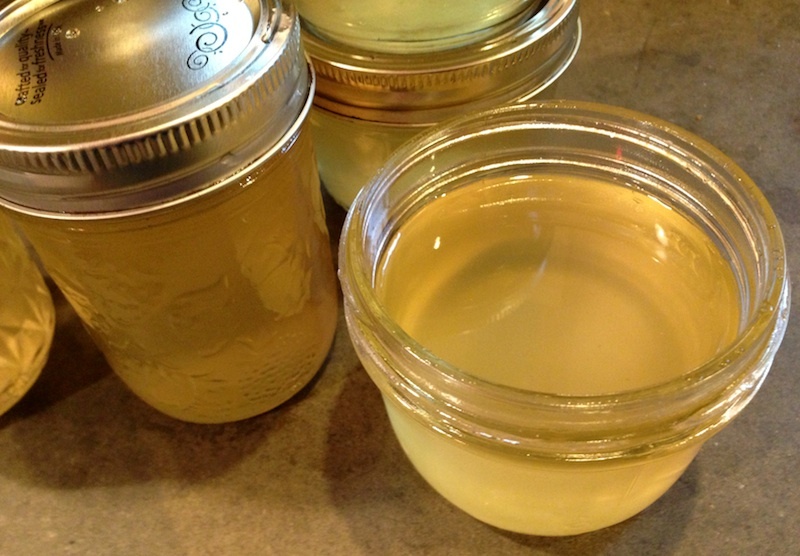 Can be refrigerated for a week or so in a covered jar or frozen in sterilized canning jars. These make terrific gifts and, believe me, you'll have plenty for later. 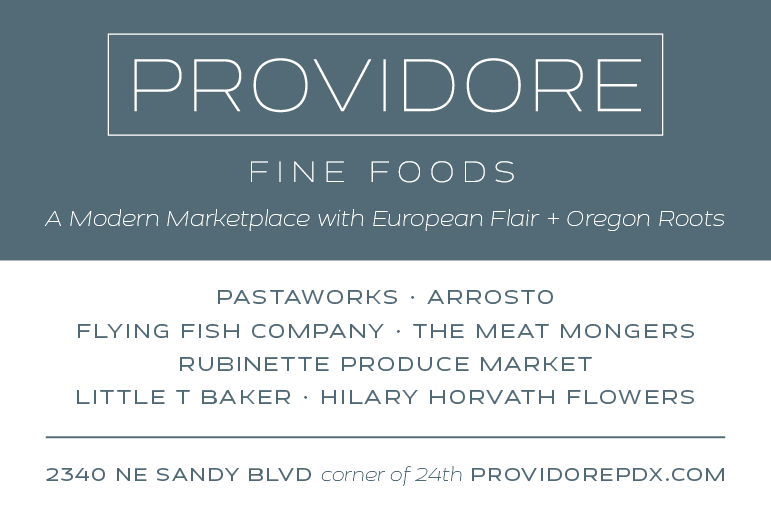 * Springwater Farm sometimes has elderflowers at the PSU and Hillsdale farmers' markets during the fleeting season when they're available. Place all of the measured ingredients in a cocktail shaker and fill the shaker halfway with ice. Shake vigorously until chilled. Strain over fresh ice into a chilled cocktail glass. 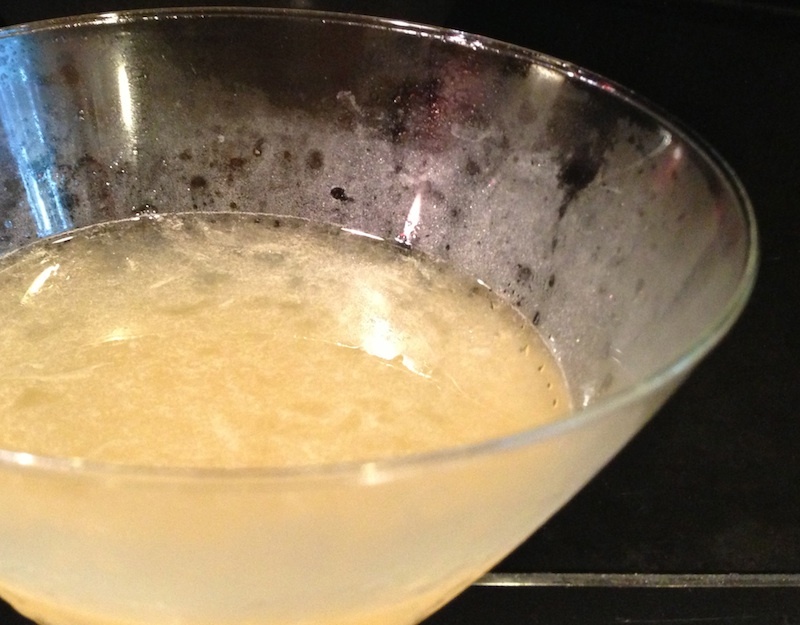 Here's a recipe for making another cocktail with elderflower syrup. How can I get an elderberry plant? I would like to try and grow it in Tennessee. 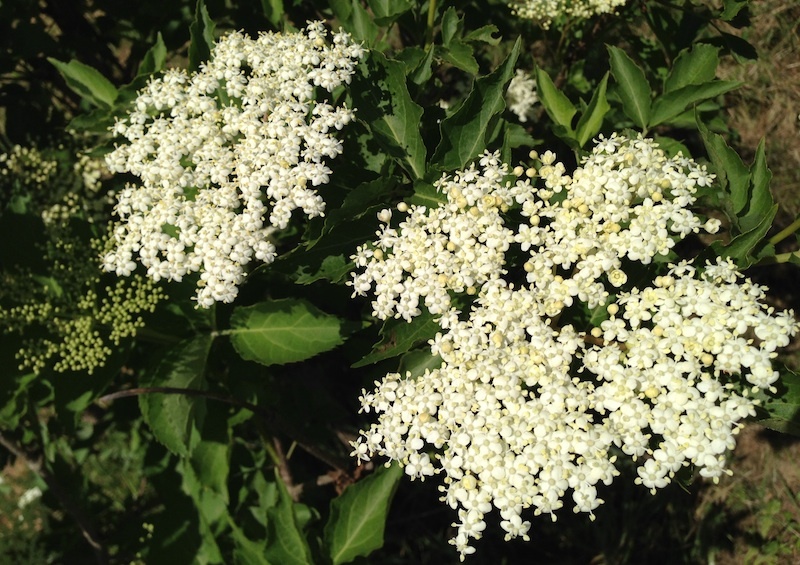 We fell in love with elderflower while in Britain. Where can you get it in the US? Well, LindaRay, according to a man named John Tullock, elderberries do grow in the Tennessee Valley, so you might call around to your local nurseries. Here's Tullock's post about them.